The National Stock Exchange (NSE) provides daily data after market hours. These data are available in different formats. We also get live data on options chain of indices and stocks. Through proper data analysis there are ways for predicting support resistance of stocks or indices using NSE options data. Before we proceed further it is highly necessary to understand how to find nse options data. For that we go to NSE site, then go to live market, select equity derivatives from drop down menu at the top, write down name of stock or indices on the box. when the desired page opens, select options chain for the selected stock or index. A page appears where we can find Open Interest data at different strike prices of stock or indices. For example, if we select options chain for Nifty we can go to the following link: NSE Options Chain. When we go to the page the page looks as follows. Now, after close watch we find there are different columns for Calls and Puts. Strike prices which are coloured yellow are in the money strikes(ITM) and rest of the strike prices which have white background are out of money (OTM) strikes. According to this picture Calls of strike price 9650 and lower are all ITM strike prices. On the other hand strike prices of 9700 Put and above are all ITM Puts. The middle column shows the strike prices. 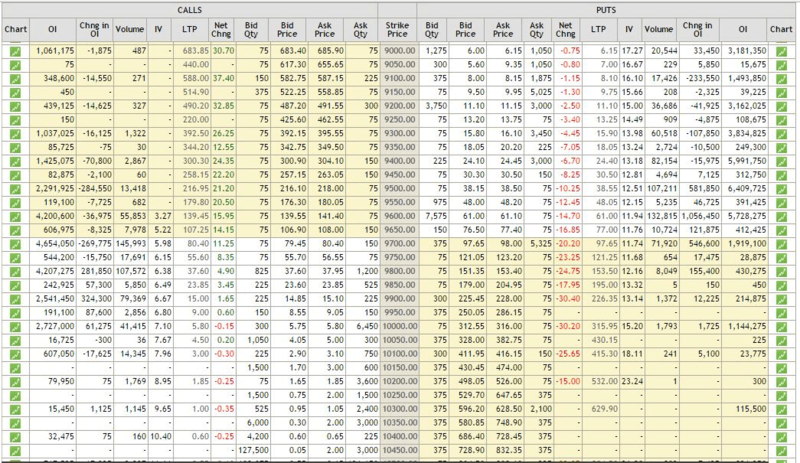 Though this table shows bid ask and LTP (last traded price) of Calls and Puts at different strike prices and data of implied volatility (IV), Open Interest is the main focus in the table. OI (Open Interest) data shows statistics of outstanding OI, latest change in OI, OI volume of Calls and Puts at different strike prices. Open interest basically applies to future and options contracts. OI can not be applied to equity. Open interest can be defined as number of outstanding contracts at any point of time in the market. Predicting support resistance of a stock/ index using nse options data is a popular method. Highest concentration of open interest at a particular strike price often denotes the immediate support resistance zone. A shift of position can also be found through change of OI data. In the table shown above we can see change of OI data where Call OI data has decreased in all strike prices from 9500, 9550, 9600, 9650, 9700, 9750 and the 9800 call strike has added lot of oI positions. This clearly shows major market participant diluted their positions from other Call positions and concentrated at 9800 call indicating 9800 as the immediate resistance zone and unless there is change in the pattern, this may hold true. On the other hand 9600 Put has added maximum OI and has the second highest outstanding OI position indicating immediate major support for Nifty. Thus we can use options chain for predicting support resistance using nse data for OI. Open Interest data can be used in many ways for guessing market sentiment or stock movement in near future. We will discuss about it in another article. Live open interest data with change of OI can be found Nifty Open Interest.